Ice dams form when a home’s escaping heat warms the roof sheathing and melts the underside of the snow layer on the roof. 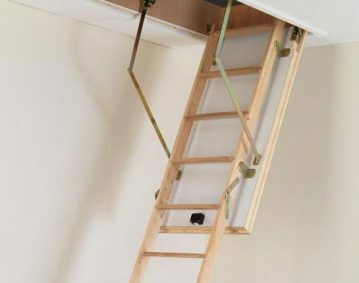 The success of this approach hinges on the ceiling of the top level of the house being absolutely airtight before any insulation is installed. (See “Attic-Insulation Upgrade” in FHB #200.) It’s also important to ensure that there isn’t anything in the attic except lots of insulation and air—not the Christmas decorations, not the tuxedo you wore on your wedding day, nothing. 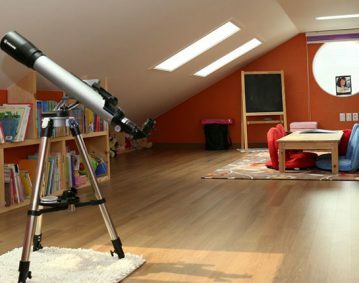 Attic space can be used for storage, but only if you build an elevated platform above the insulation. Otherwise, the insulation gets compressed or kicked around, which diminishes its R-value. Also, attic-access hatches are notoriously leaky. 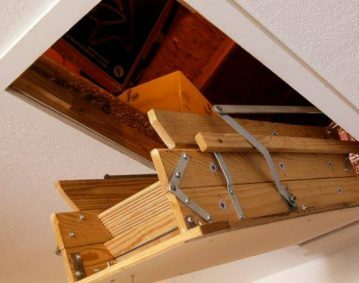 You can build an airtight entry attic, but you should know that the more it is used, the leakier it gets. Don’t think you can get away with putting ductwork in an unconditioned attic just because you sealed and insulated it. Duct-sealing is faith-based work. You can only hope you’re doing a good-enough job. Even when you’re really diligent about air-sealing, you can take a system with 20% leakage and bring it down to maybe 5% leakage, and that’s still not good enough. With regard to recessed lights and other ceiling penetrations, it would be great if we could rely on the builder to air-seal all these areas. Unfortunately, we can’t be sure the builder will air-seal well or even air-seal at all. So we have to take some of the responsibility out of the builder’s hands and think of other options. It should be noted, however, that in high-snow-load areas, you still need a vented over-roof to deal with ice damming. In essence, you’re creating a hybrid vented/unvented roof system.The goal in an unvented roof is to keep the roof deck—the principal condensing surface in roof assemblies—sufficiently warm through the year to prevent condensation from occurring. In most climates, builders have to insulate the roof sheathing to prevent condensation from occurring within the assembly. The exception is hot-dry climates such as in Phoenix, where condensation isn’t as big an issue. Condensation control is most often accomplished by installing rigid foam above the roof deck or by installing air-impermeable spray-foam insulation directly against the underside of the roof deck. The code also allows for air-permeable insulation, such as fiberglass or cellulose, to be used under the roof deck as long as rigid foam is used above the roof sheathing. Flash-and-batt (or flash-fill) assemblies are also allowed. Any of these approaches can adequately prevent condensation from occurring within the roof when the rigid foam or spray foam is installed at the appropriate thickness. If you’re spraying foam on the underside of the roof deck, be sure you’re using the right product. Closed-cell spray foam works in all climates, but especially well in climate zones 5 through 8, where high R-values are desired and where air-impermeable insulation also must be a vapor retarder. Low-density, open-cell foam is permissible, but in climate zones 5 and above, it has to be covered with a vapor-retarder coating, like rigid foam or painted drywall. Also pay attention to roofing materials. Asphalt shingles require special attention when installed on unvented roof assemblies in hot-humid, mixed-humid, and marine climates due to inward vapor drive. To keep moisture out of the roof assembly, a roofing underlayment with 1 perm or less (class-II vapor retarder) must be installed under the shingles. Also, check to be sure that you are in compliance with the manufacturer warranties when installing shingles over an unvented roof in all climates. Some manufacturers don’t warranty or offer only a limited warranty when their products are used over an unvented roof assembly. Extra Credit: Site-built or prefab baffles? 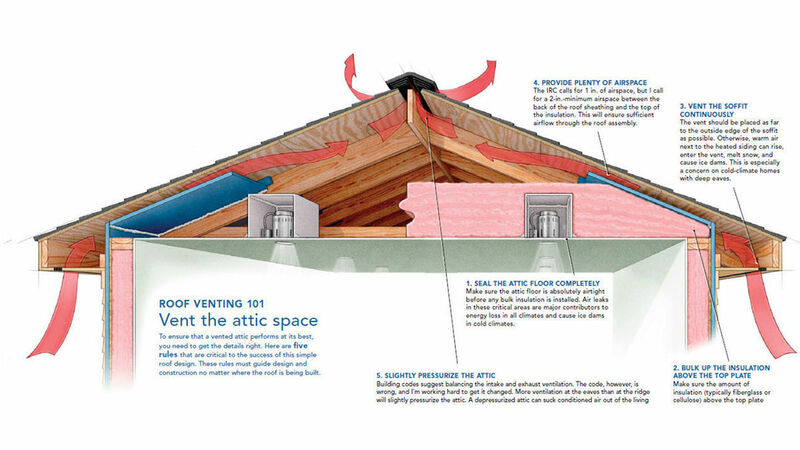 The success of a vented attic or roof deck relies on its airtightness. The space above the top plate of exterior walls—at the bottom of each rafter bay—is especially important. Baffles placed in this area channel intake air into either the attic space or vent chutes, and also prevent insulation from falling into the soffit and blocking airflow.